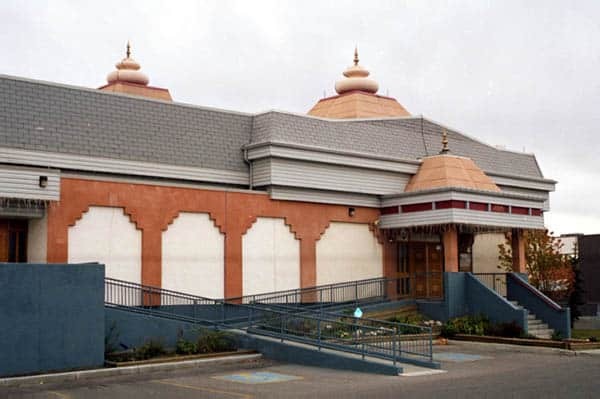 The Hindu Society of Calgary, formed in 1974, has a membership of approximately 1000 families and also looking into further extension of the existing facility for which a development permit has been obtainted. It provides religious, cultural and social services in Calgary and the surrounding area. With the help of its dedicated and generous members, the Society opened its first nondenominational Hindu Cultural Centre and Temple in 1990. Since then, in 1993 the Society purchased additional land, adjacent to the current premises, to meet the growing needs of the community. The Society is looking into using this land for building a cultural centre, priest’s residential quarters and facility for the school. Through the centre, the Hindus are reaffirming their heritage and leaving a legacy for their children. In addition, for all Canadians, the centre is a reminder of the diversity that has shaped this country. The Society also operates the Hindu Vidyalaya (school) to teach formal courses on Hindu Dharma and Hindi Language. Among the objectives, the Society promotes the understanding of ethical, social, religious and philosophical foundations and practices of Hinduism. The Society fosters a spirit of dedication and devotion to Hindu values as suited to modern times. Yajmans are welcome for all poojas and Sunday services. Please call VP Religion or phone the Mandir at 403-291-2551. 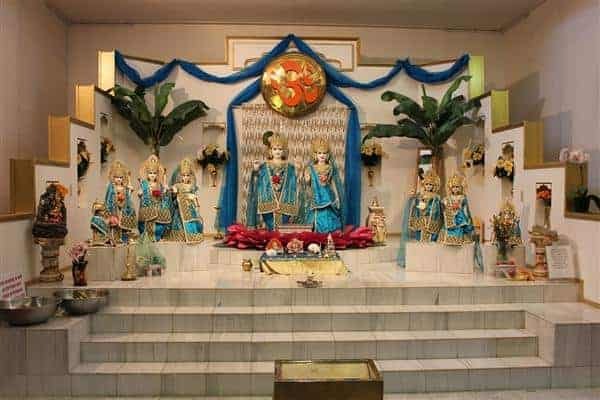 Since the early seventies, when a number of Hindu families started to settle in Calgary, Hindu worship in the form of Pooja and Havans was practiced in individual homes. At the end of each Havan, a sumptuous meal would be served and discussions often took place about the necessity of a temple and a cultural centre. As a result, the Hindu Society of Calgary was born. Brij Sood continued to be the President till 1979 and was responsible for acquiring the St. Barnabus Church for use on the first Sunday of every month for the religious congregation and Hindu festivals. “During these four years we started to feel like a family by having our regular satsangs and celebrating Hindu festivals”, recalls Brij Sood. The Hindu community was fortunate in having the guidance of elders like Pitaji and Bauji to insure that Hindu traditions were maintained. The religious program consisted of “yajna with devotional singing”, according to Santosh Mongia. During 1979 and 1980, the society started looking for a permanent home. An attempt was made to buy the Croation Hall, but members of the society wanted to build their own centre and so an offer was made on a 10-acre parcel of land in the Springbank area. While the attempt was unsuccessful, owing to the legal title problems, the membership was determined. “We raised about $50,000 in l980 which gave us the seed money to proceed”, recall Chaman Narang and Dr. Inder Nath Kher, president and vice president (Cultural Programs) respectively. The involvement of children in the society’s activities was further strengthened with the operation of the Hindi school, organized by Drs. Inder Nath Kher and Anil Khosla and run by Shri Dwivedi, Manjula Sinha and Linda Prasad. During 1981, president Pramod Sood performed the task of pulling the society together. Money paid for the land was recovered and the society moved on to the next phase. In l992, the society purchased five acres of land in the Springbank area, closer to other churches. A multi-cultural hall was designed by Viri Shankardass and a federall grant of $250,000 was arranged. However, on appeal by the neighbors. the society lost the development permit. It was a great disappointment, but the society had collected an additional $70,000. A third Sunday satsang to widen the worship was introduced. “We wanted to encourage other Hindus to come and worship in their own traditions”, recalls Ashok Bhasin, president in 1982 and 1983. Shrinath Dwivedi played an increasing role as the lay priest. During the second satsang of the month, recitations from Tulsidas’s Rom-Charit-Manas were introduced. In addition to the Deepawali festival we started celebrating Ram Navmi, Duussehra and Janmashtami festivals too. During the presidency of Arun Sood in 1984, Laxrni Mital in l985 and Brij Sood in l986, a weak economy in Calgary made it difficult to make another attempt to build the temple. Many alternatives were explored The society increased its membership and developed greater involvement of children in its activities. During l983-84, with the passing away of its elders, Pitaji and Bauji, the society lost their valuable guidance. Mr. Ved Madan shared the increasing workload as a lay priest, and started conducting the Havan ceremonies. After the untimely demise of Ved Madan in 1986, his wife Asha Madan and Deepak Obhroi’s mother began to provide the priestly services but limited to the performance of Havan. Hindu Centre is available for members’ use on rental/donation basis. For availability, hours of operation and usage fee, please contact the VP Maintenance or phone the Mandir at 403-291-2551. The Hindu Study Circle meetings are held at 2:00pm on the second Saturday of each month in the Mandir.For more information on these meetings, please contact Dr. G.N. Sharma at 241-2391. The Hindu Society provides a vegetarian meal to needypeople once a month at the Drop-in Centre.Any volunteer help for this worthy cause is greatly appreciated.For further information and volunteering your services, please contact Mr. AbhimanyuSingh @ 403-242-4982 403-242-4982, Suman/Subhash Katyal @403-281-7757 403-281-7757, or Mayura Rangayyan @403-239-7380 403-239-7380. Please come and join for Hanuman Chalisa every Tuesday from 6:45 P.M. in the Temple. We now have an excellent stage with proper curtains and sound system in the basement of the Mandir.This is ideal for variety entertainment and we offer these facilities to members and non members at very competitive rates.For details, please contact the VP Maintenance or phone the Mandir at 403-291-2551 403-291-2551. Time: Monday to Sunday Temple Hours (open 7 Days)10:00 A.M. to 1:00 P.M.5:00 P.M. to 9:00 P.M.